LITTLETON, CO. — Former Broncos wide receiver Rod Smith was on hand Saturday, Sept. 27, at Littleton Sports Authority’s re-grand opening this past weekend. The new store layout and decorations took the already brilliant visuals over the top, Rod Smith (Hall of Fame Denver Bronco) signed gear for eager fans, and local school districts and other community marketing reps partnered at the ribbon cutting. Source: Sports Authority. 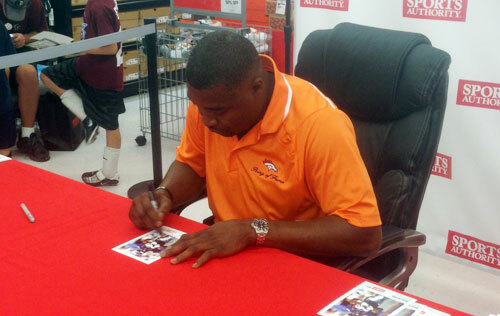 Photo shows Rod Smith signing autographs Sept. 27, 2014 at Littleton, Colorado Sports Authority. Rod Smith is a former NFL wide receiver who played thirteen seasons for the Denver Broncos. He was originally signed by the Broncos as an undrafted free agent where he ended up playing his entire career with the team. He is ranked 22nd in NFL history in career receptions and 26th in receiving yards. Smith left the Broncos as one of the most well-loved players of all time. In May of 2012 it was announced that he would be inducted into the Broncos Ring of Fame in his first year of eligibility for the honor. The induction ceremony took place on Sunday, Sept. 23, at halftime of the Broncos’ home game against the Houston Texans at Sports Authority Field at Mile High. Today Smith is a successful motivational speaker and business entrepreneur. Sports Speakers 360 is a booking agent for pro athletes. If you would like to book football speakers or athletes like Rod Smith for a speaking engagement, autograph signing, product endorsement, fundraiser or special event, contact Rod Smith’s booking agent for appearance and speaker fees at Sports Speakers 360. For booking agent and appearance fee information on how to hire Denver Broncos players for appearances, call 1.855.303.5450.